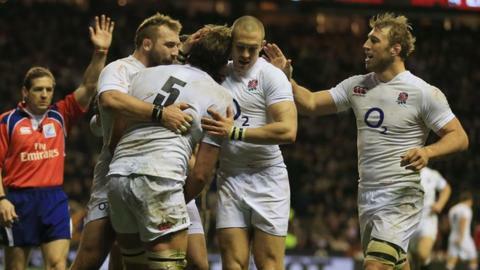 England overpowered great rivals Scotland to retain the Calcutta Cup and get their Six Nations campaign off to the perfect start. A try on debut from Billy Twelvetrees and equally clinical scores from Chris Ashton, Geoff Parling and Danny Care, added to 18 points from the boot of man of the match Owen Farrell, were fitting reward for a dominant display. Sean Maitland's 10th-minute try offered the visitors brief early hope of a long-overdue upset, but they led for less than four minutes. A late rally after a brilliant length-of-the-field break finished by Stuart Hogg narrowed the margin but never threatened to overturn it. Scotland have now gone 30 years without a win in the English capital and England's young side will now travel to Dublin with confidence high as they continue to develop quickly under coach Stuart Lancaster. Farrell's penalty on two minutes had given his side an early lead, bullocking runs from Ben Morgan and Tom Wood then punching huge holes in the Scottish rearguard as Lancaster's men began at pace. But it was Scotland who silenced Twickenham with the first try of the day. Mike Brown's clearing kick found Hogg in space, and the full-back ghosted between Mike Brown and Dan Cole before clattering through Alex Goode. Debutant Maitland was free on his shoulder, only for Hogg to hold on, but after his forwards made further inroads the winger was able to dive over in the corner from three yards out. Indiscipline at the breakdown from the Scottish forwards gave Farrell the chance to land a brace of penalties for 9-5, Greig Laidlaw adding one of his own to keep the match in the balance as the half-hour approached. It was an open game, with both sides looking to put the ball through hands on a dry but bitterly cold afternoon. And England struck next as their mobile forwards thundered at the Scottish defence. Joe Launchbury took a short pass from Joe Marler and drove through a tackle, sucking in defenders, and the lurking Ashton took Ben Youngs's pass at pace to crash between Sean Lamont and Ruaridh Jackson and reach out to touch down. Farrell's conversion and fourth penalty after a high tackle on Morgan made it 19-8, Laidlaw reducing the deficit to 19-11 at the interval with his second penalty after Wood transgressed. England, so impressive in their previous match at Twickenham, the record 38-21 defeat of New Zealand, then took control as the second period began. Quick ball and incisive drives set up possession deep in the Scottish 22, and a flat pass from Ben Youngs allowed Twelvetrees to take the ball at pace and thump through Dougie Hall and Jim Hamilton for his first international try. It was fitting reward for a composed display from the Gloucester centre, only in the team because of injury to Manu Tuilagi. The faultless Farrell added the conversion, and then threw a beautiful long miss-pass to pick out lock Parling loitering on the left wing for the Leicester man's own maiden England try. Launchbury had a try ruled out for a high tackle earlier in the move, before the game meandered for a while as errors crept in on both sides. Scotland then rallied, turning the ball over close to their own line and putting it through the hands before Maitland kicked ahead and Hogg won the race to touch down ahead of replacement Toby Flood. But Scott Johnson's men could do little more to break down the well organised home defence, and when Care burrowed over at the death, a capacity crowd celebrated another encouraging victory. England: Goode; Ashton, Barritt, Twelvetrees, Brown; Farrell, B Youngs; Marler, T Youngs, Cole, Launchbury, Parling, Wood, Robshaw, Morgan. Replacements: Strettle for Goode (68), Flood for Twelvetrees (68), Care for B. Youngs (58), Vunipola for Marler (58), Hartley for T Youngs (54), Wilson for Cole (74), Lawes for Launchbury (65), Haskell for Morgan (46). Scotland: Hogg; Maitland, Lamont, Scott, Visser; Jackson, Laidlaw, Grant, Hall, Murray, Gray, Hamilton, Strokosch, Brown, Beattie. Replacements: Evans for Hogg (79), Pyrgos for Laidlaw (74), Ford for Hall (48), Denton for Strokosch (14). Not Used: Low, Cross, Kellock, Weir.